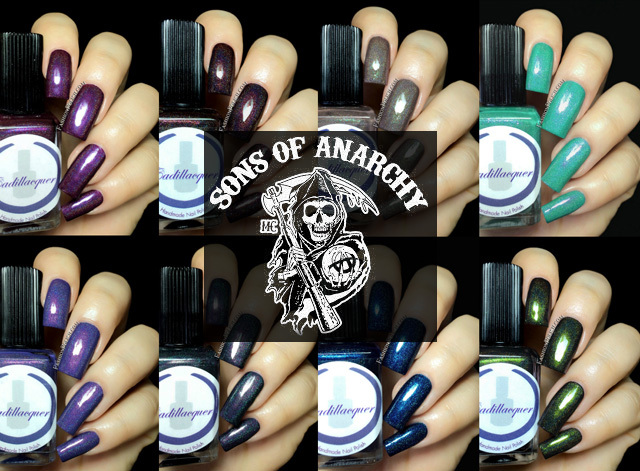 Fashion Polish: Cadillacquer Sons of Anarchy Collection swatches and review! Cadillacquer Sons of Anarchy Collection swatches and review! And talking about amazing polishes, I have swatches of the latest Cadillacquer collection to show you today. Formula was, as usual, flawless on the entire collection. I used 2 coats plus topcoat in all of my swatches and they were all easy to work with, particularly even and fully opaque. Patch Over is a mushroom taupe holo with a contrasting green shimmer and color changing micro flakes. 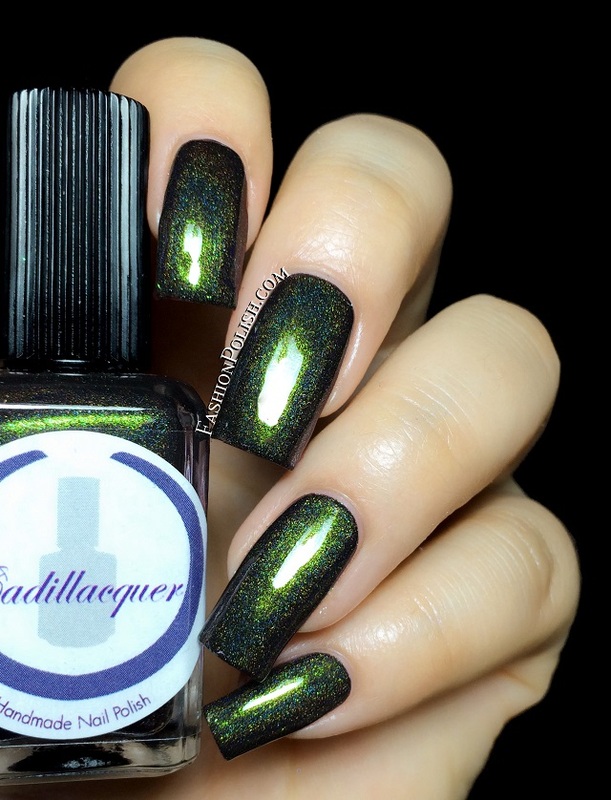 Men of Mayhem is a blackened green holo with color a strong green shimmer and color changing micro flakes. The Rest Is Silence is a light turquoise holo with light purple/pink shimmer and flakes. Welcome To Charming is a lavender holo with reddish pink shimmer and red flakes. 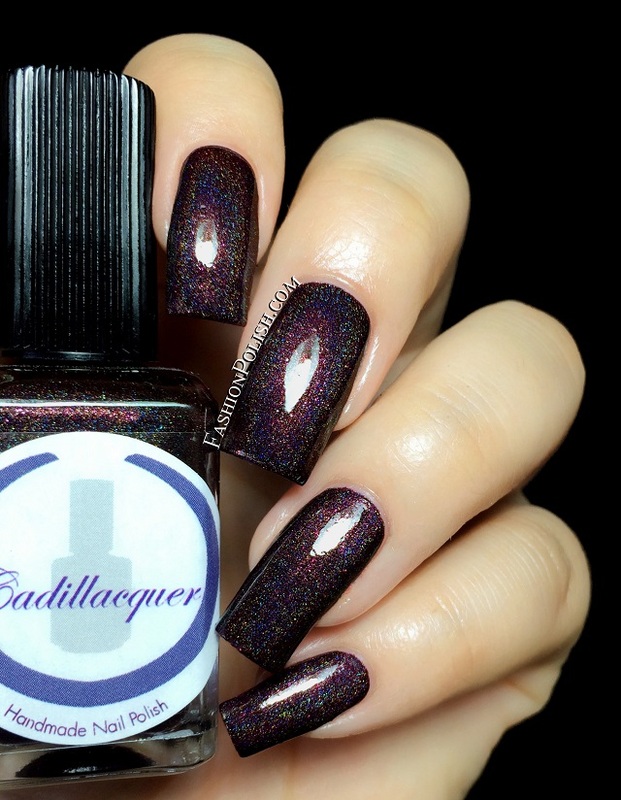 Firinne is a plum holo with blue/copper shimmer particles. Day Is Gone is a dark teal holo with red/copper color shifting shimmers. Ink is a sapphire blue holo packed with bright blue flakes. Redwood is a dark brownish red holo with light red flakes and shimmers. A stunning collection! I've always loved the passion for detail Madeleine puts in her polishes and I have to say that these have reached a whole new level of perfection. My favorite Cadillacquer collection ever! The Cadillacquer Sons of Anarchy collection has launched last week and sold out in minutes. So what do you think abut this collection? Are you an avid SoA fan?